This afternoon, Dan called me to the window to point out the cardinal. He was hanging on to the side of Dan’s Jeep, checking itself out in the reflection of the side mirror. I grabbed my camera and tried for a few shots, but unfortunately there’s a very large lilac bush between the house and the cars. The birds are loving it for perching in when coming to visit the feeder, and it will be tremendously lovely in the spring when it blooms, but it did make it difficult to get a good view of the cardinal. This was the best shot I could manage, and you almost need to know what’s going on to be able to pick out the details in the photo. Oh well. Can’t win them all. I was mostly interested in documenting it because it’s the first time I’ve personally witnessed this behaviour, which is actually rather common in cardinals. It’s a territorial thing, they think they’re attacking an intruder. 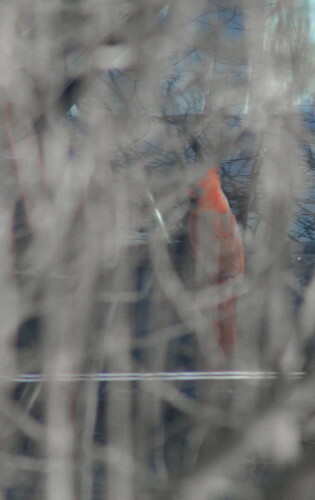 Since cardinals hold their territories year round, the behaviour can be observed in the winter as well as the summer. What’s the difference between a cardinal and a carnival? A single line that turns a sideways-v into a d.
Okay, I’m sorry about that. But I had to draw a connection somehow, didn’t I? Two carnivals up recently that are worth checking out. The first is I And The Bird #115, being hosted this edition by Jason of Xenogere. Jason adopts and adapts “original and unadulterated Thoreau” to share the links for this carnival. Curious what the heck that means? You’ll have to go check it out! And the second is the inaugural edition of House of Herps, which coincidentally happens to be the brainchild of Jason, as well, in partnership with Amber of Birder’s Lounge. This fine first edition gifts us with much great herpetological reading, so make sure you swing by to pick up your presents! Thank you so much for the carnival shout-out, Seabrooke! I’m grateful for your support. Oh, and that cardinal behavior? I’ve heard all about it–but I’ve never seen it for myself. I’m jealous!